Just as every child is different, every birth is different. Mums like swapping birth stories, so here is mine. If you are a first-time Mum I hope you find this helpful instead of off-putting! For me, writing this is like free therapy. I had a pretty tough pregnancy with Sausage. Although I never threw up, I was nauseous for 18 weeks and went off food for several weeks. Women who’ve been pregnant will know what I mean – you don’t know what you want to eat, but you sure as heck know what you DON’T want to eat. For a while there I could only tolerate the blandest food, like English muffins and frozen mixed veg. My poor husband tolerated these meals with good grace, and was even kinder when I turned up my nose at his cooking. The nausea was soon replaced with heartburn (I was considering buying shares in Gaviscon, I had so much of it), constipation, and a pulled muscle in my side that saw me making many trips to a cranial osteopath. At around 30 weeks I started to get insomnia (I am not the world’s best sleeper at the best of times). I would wake up in the wee hours of the morning and would not be able to get back to sleep until 5:30-6:00am. On the plus side, I read lots and lots of books! At Sausage’s 20 week scan we discovered that she had a club foot. I will never forget that moment, and the look of pity on the sonographer’s face. I didn’t know much about club feet, other than the feet turning inwards, and thought it meant that our precious baby wouldn’t be able to walk properly. I have a disabled brother and so I know all too well the reality of life for those with disabilities. I was completely shocked, especially as previous scans and blood tests had shown the baby to have a low risk of any birth defect. I burst into tears and asked the sonographer what this meant for our child. She just said ‘I can’t tell you, I’m not an expert in this’, but did say she saw kids with club feet a lot and knew it was treatable. I still feel really angry about this. Not at the sonographer who is just doing her job, but angry at the way news like ours gets handled. Club foot IS reasonably common. How hard would it be for sonography clinics to hand out a basic pamphlet on this and other similarly common conditions??? You know, just something that describes the condition and any likely treatment. I bawled my eyes out for the rest of the appointment. Amongst the tears we were also given the news that we were having a girl. I had been convinced that Sausage was a boy and was quite surprised at the news that she was a girl. My first thought was ‘Damn, now we have to find a name!’ as we’d had a boy’s name picked out but hadn’t been able to decide on a girl’s. We were told that our Lead Maternity Carer would arrange an appointment with an orthopaedic surgeon who would talk us through the treatment. As it was, the first thing my husband D and I did was google club feet. Fortunately we soon found a New Zealand site where someone had described the treatment process and said that by the time her son was two, you would never know that he’d had anything wrong with his feet. While it was a massive relief to know that our girl was going to be okay but I was still hugely upset and in shock at the news. A similar thing happened to a friend of mine who was pregnant at the same time as me. She’d been sick and was given a blood test. The hospital rang her to tell her she had the CMV virus, and that an appointment had been made for her to talk to a specialist on Monday (she was told the news on a Friday). You guessed it, she had no option but to look it up on Dr Google which was full of worst-case scenario news. The virus, while little more than a cold to adults, can be devastating to a foetus as it can cause deafness, blindness, and learning disabilities. Fortunately her baby has turned out just fine, but jeez people! Have a think about how this sort of news is given to parents. In her case it would have been better for the hospital to have said nothing until she saw the specialist. Sausage was due on New Year Day which meant we were unable to find an independant midwife who was available over the festive season. Instead we were referred to the hospital midwives. The antenatal care was good as the hospital made an effort to get you an appointment with the same person each time, and our midwife was lovely. She explained that the Maternity ward had its own set of midwives so she (or any other of the antenatal midwives) would not be the ones present during labour. Meaning you have a complete stranger caring for you during labour. Still, I figured that by time I was really in labour I probably wouldn’t care who was in the room! As this was my first baby, I wanted to have her in hospital just in case something went wrong. It was one of the hottest summers on record, and I seriously thought I was going to DIE on Christmas Day. It was such a hot, still day. Sausage was sitting high up so I was finding it difficult to breathe in the oppressive heat. We were renting at the time and there was no air-conditioning in our house. We’d returned from Christmas lunch with the in-laws to find our house resembled a Scandinavian sauna. Just when I thought I would have to de-camp to a hotel for the night, our lovely neighbours offered us their place as they were away for a few days. I sat under their air-con feeling intensely grateful for having such great neighbours. I reached my due date without any action happening and had all sorts of midwife appointments, scans and electrodes put onto my tummy to see what that cheeky baby was up to. One of the midwives made me wince by saying she reckoned Sausage was going to be 4.5 kilos. At 41 weeks the sonographer informed us that Sausage had really long legs and we should sign her up to be a netballer immediately (there are some tall genes in our family). She also said that the baby looked quite comfortable and not at all as if she was planning to vacate anytime soon. This meant an induction. Ugh. I really, really did not want an induction as I knew it would probably lead to an epidural and those sounded scary. I also was not relishing having to spend the night in hospital by myself. All the raspberry leaf tea, pineapple, curries, nookie, and stair-climbing did nothing to persuade Sausage to leave the womb. At 42+1 I packed my bags and went with D to the maternity ward on a Tuesday night. It was quite surreal to be going there by appointment. I guess I’d imagined the whole waters-breaking, painful-waddle-to-the-ward scenario. Instead we were calmly led straight to a delivery suite, as it was a quiet night at the hospital (normally you go into a ward). We had a lovely student midwife who explained I would have prostaglandin inserted vaginally to kickstart labour. She said typically not much happened, and I would be left to sleep for the night and have my waters broken in the morning. We were given the good news that D was allowed to join me for the night as Delivery Suite had a chair that converted to a bed. Holy moly, thank goodness for that! I didn’t end up with my good night’s sleep at all. I started having painful contractions around 11:30pm. D and I were mostly left alone for the night while I wandered round the room swearing like a marine with each contraction. At no point did any of the midwives who popped in to check on us offer me any pain relief, and I wasn’t in any sort of headspace to ask for it. At 8:00am I was assessed by the registrar and was told he would break my waters as I was 3 centimetres dilated. That was an incredibly painful experience. My contractions were so intense by this time that I begged for an epidural. Getting the epidural was the strangest experience of my life. A few minutes felt like hours, and I remember people’s voices sounding like they were very far away, and sort of ‘waaah, waaah, waaah waaah’ – Charlie Brown style. The epidural insertion went perfectly, and it seemed that in no time I went from extreme pain to sitting up calmly reading a book! When the midwives changed shift that morning we were pleasantly surprised to see a familiar face, as one of the antenatal midwives was covering holiday leave for the maternity ward midwives. We’d only met her a couple of times, but she was fabulous. We swapped stories and found out we had lots of interests in common. It certainly added to the feeling of being in safe hands. As my labour progressed they stopped the epidural so I was able to know when to push. I had no idea that this would happen! I think I expected an epidural labour to be totally pain-free. Not so, folks. 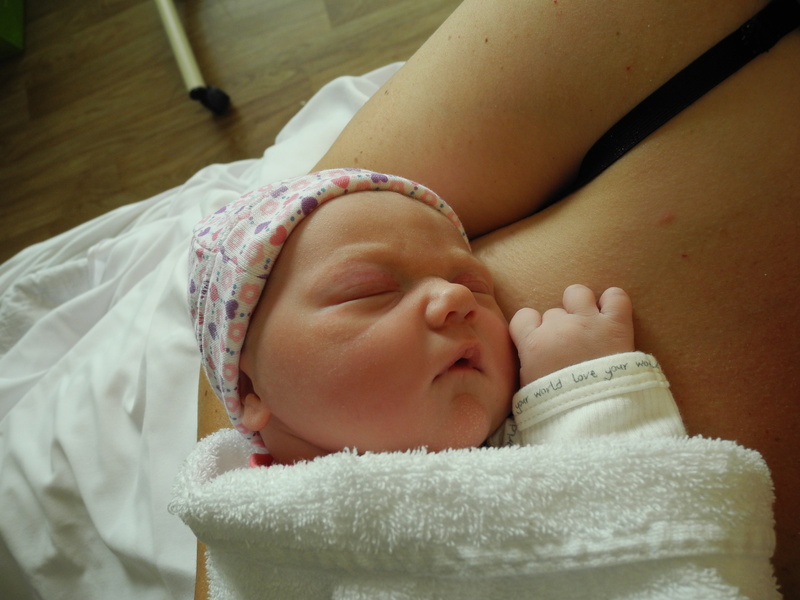 After a long bout of pushing, our daughter Eloise (aka Sausage) was born at 3:42pm and weighed 3.5 kilos (phew!). I remember being very surprised to see that Sausage did not resemble either my husband or I. Over the next few days as her face de-squashed she resembled my mother, and now looks very much like I did as a child except with my husband’s colouring. And so our kid wrangling adventures thus began! Recently our household began to do something I’ve been meaning to do for a very long time – we’re now buying organic fruit and vegetables. I grew up eating a lot of organic produce (my Dad is a naturopath), but like a lot of people, the cost stopped me from buying it once I’d left home. If you are a poor student and you have a choice between organic apples at $4.99 a kilo or non-organic apples at $1.99 a kilo, you’re going to go for the non-organic option. It’s a no-brainer. I guess for a long time I’d put organic food in the category of being a ‘privileged-class luxury’. My kids are a big reason I’ve decided to go organic. Children are much more susceptible to toxins than adults, and my word, there are some nasty pesticides used in clean, green New Zealand. Kids eat a lot of fruit and if they haven’t got to that ‘veges = yuck’ stage, then vegetables make up a lot of their diet too. Just by switching to organic fruit and vegetables you reduce the number of nasties going into their systems. Another big reason I wanted to go organic is I seem to be increasingly sensitive to chemicals. I always have been, even as a child (my worst nightmare is walking down the cleaning products aisle at the supermarket, second worst nightmare is walking by the perfume counter at a department store…), but in the past couple of years my sensitivities have been getting much worse. I can no longer wear most perfumes, lots of shampoos and toothpastes make me gag to the point where I almost throw up and leave me with streaming eyes. Anytime we need some industrial strength cleaning done in our house, it’s my husband who has to do it. I try to use natural products to eliminate any reactions, but I am constantly battling mild contact dermatitis on my hands from having inadvertently touched something; and I have a perpetually runny nose that nothing can be done about (seriously, I should buy shares in Kleenex). After noticing the effects that handling some fruits and vegetables have had on my poor hands, I decided enough was enough. I found a Whanganui organic fruit and veg delivery business on Facebook, called Go Organic. The owner, Kim, really impressed me with the flexibility of the products she delivers. If you don’t like something, just tell her and it won’t go in your box. Just want fruit? Okay. Only veg? Okay. Didn’t use all your fruit from your last box? No worries, she’ll add more veg to your next box. Discovered you need a bigger or smaller box to meet your needs? Not a worry. 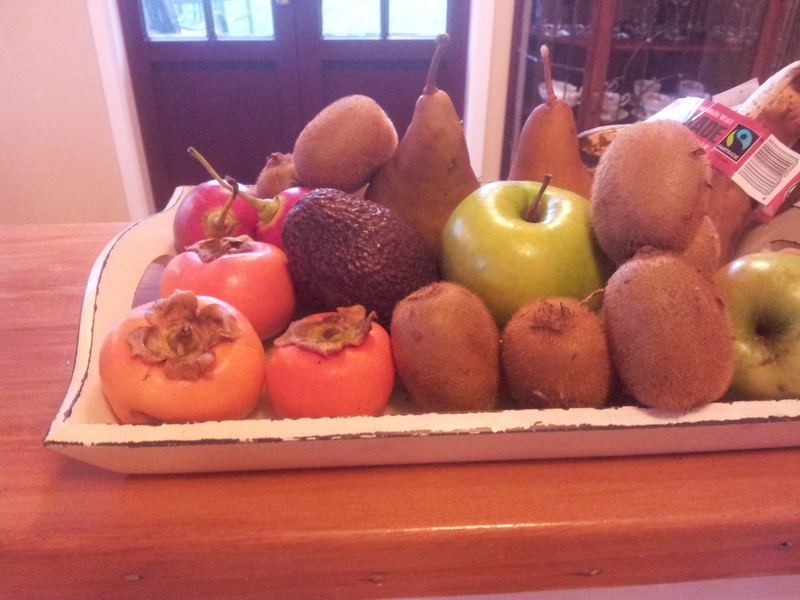 Most produce comes from Whanganui so we are supporting both Kim’s business and local growers. Warm fuzzy. We decided on a $30 fruit and veg box to start with. I must admit to being a little underwhelmed when I saw the amount of produce that $30 got us (the box seemed small), but I was pleased with the variety and reminded myself that organic food simply costs more. We got kale, tamarillos (hubby’s favourite), persimmons, onions, potatoes, pumpkin, cauliflower, pears, kiwifruit, apples, carrots, an avocado and a big bag of salad. We also got a mysterious green branch that looked a bit like bamboo, which we later found out was lemongrass. You don’t get heaps of everything, just a few of each thing, but it was enough for our family of 2 adults, 1 child and 1 almost-here-child. Really, when you see it all written down like that, it was a pretty good haul! We’ll be eating seasonally. Seasonal eating is better for my pocket, supports local growers and reduces my carbon footprint as I’m not chowing down on Californian oranges. Having never bought a persimmon before in my life, I can see that we will eat things that we might not otherwise try. I’ve never cooked with lemongrass before either, so new recipes will be discovered too. Paying more for my produce has made me determined to eat EVERY.LAST.BIT OF.IT. The less food we needlessly waste, the better. Organic food just tastes better! It really, truly does. If you’ve ever grown your own tomatoes and compared them with the watery supermarket version, you’ll know what I mean. We’re supporting our local growers. Our local economy is not in great shape right now, so every little bit of cash that is spent helping our small businesses helps. I realise that for many people, organic food is simply just out of their budget. Others try and buy it when their budget allows. The best solution for all of us is to try and grow our own produce as much as we can – even if you’ve just got a few pots in your apartment. I quite like gardening, and we are blessed to own a home with a humongous garden that has plenty of fruit trees. My plan is to eventually grow most of my own produce, but while I have very small children it won’t be a reality for quite a while. 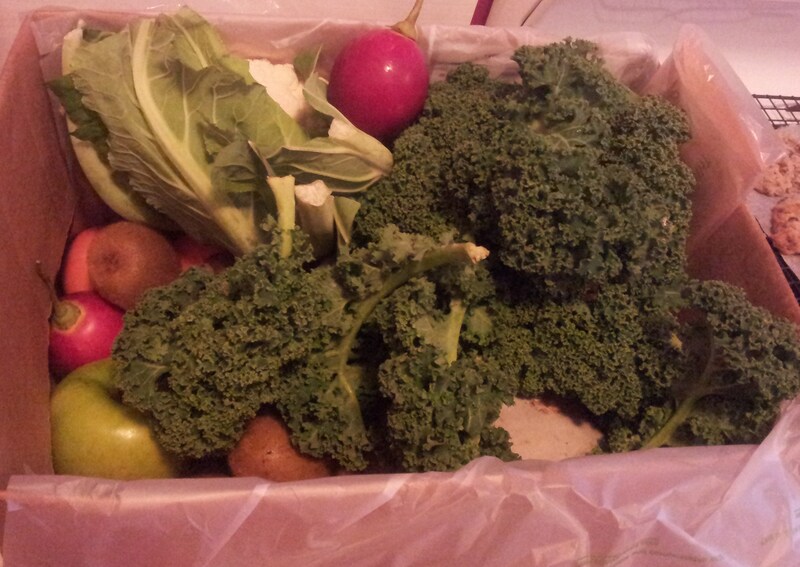 In the meantime, I intend to enjoy my weekly produce delivery! If you live in the Whanganui area and are keen on giving Go Organics* a try, call Kim on 027 307 3062. * I am in no way affiliated with Go Organics. All opinions expressed are my own.